Now, this next one up isn’t exactly the easiest to find. But I consider it to be worth it. Tabula Rasa’s Herbs scent seems predominately dominated by lemongrass, with a few hints of some other herbal scents. So, if you like lemongrass, you’ll rather like this one. I certainly did. Strength-wise, it’s spot on I’d say. Once lathered and applied to the face, it’s very noticeable without being over-powering. There’s only a slight amount of fading near the end of each pass, but other than that I’d say the strength is perfect, IMHO. As for the shave itself, this one also knocks it out of the park. As with most “croap” samples, I treated this one more like a cream, by scooping a little out of the sample container into my scuttle and building the lather there. After all, it’s kind of hard to load a brush in a tiny plastic cup like that. 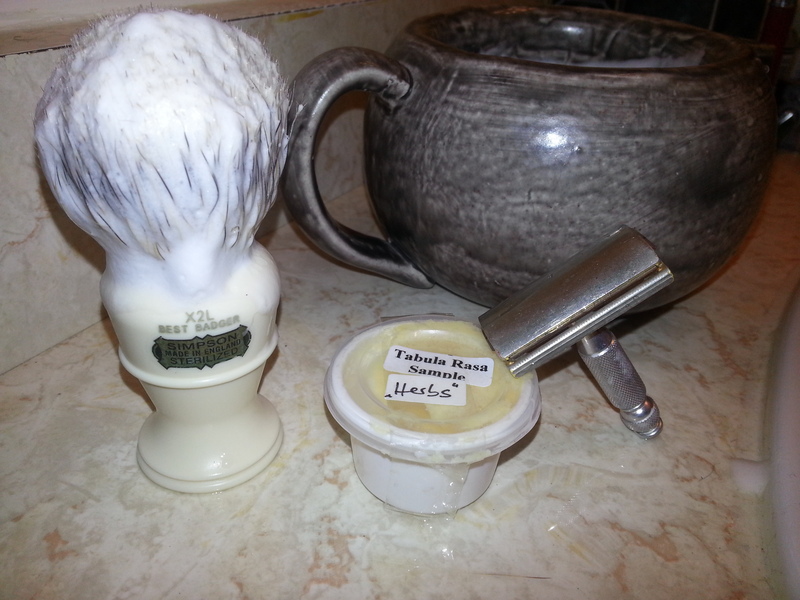 With just a little bit of water, it very easily whips up into a wonderfully thick and slick lather, which gave just a top notch shave. Tabula Rasa does a great job of aiding you in the daily chore of making a “blank slate” out of your face. For comparison, it’s very reminiscent of Al’s Shaving Products’ Saigon scent. They both give great shaves, and they both have a nice and strong and very similar scent. Overall, a very strong 9/10. I’d highly recommend at least trying a sample if you get your hands on one. But that might be difficult. Plus Al’s Saigon is cheaper. Maybe get that instead of the Herbs, and get some of the other scents (Mmmm Dark Lavender) for Tabula Rasa. Cost: Beats me. I got the sample off someone who had had it thrown in free after he ordered a few jars straight from the manufacturer. This scent can’t currently be found online anywhere; the only North American distributor of the brand is Lee’s Safety Razors, where he sells the scents he has for $29 a tub. He doesn’t currently sell this scent, however, but mentions that he should be getting four new ones in in March; hopefully this is one of them. Otherwise, you can try to contact Xenia, who makes the soap off her website. Although it’s all in German, I’ve been told that when corresponding via e-mail that her English is just fine. Ingredients (note: this is for the unscented version, I presume only minor differences for the “herbs” scent): Aqua, Stearic Acid, Glycerin, Cocos Nucifera Oil, Argania Spinoza Kernel Oil, Hordeum Vulgare Wax, Butyrospermum Parkii Extract, Mangifera Indica Butter, Potassium Hydroxide, Sodium Hydroxide, Sodium Borate.